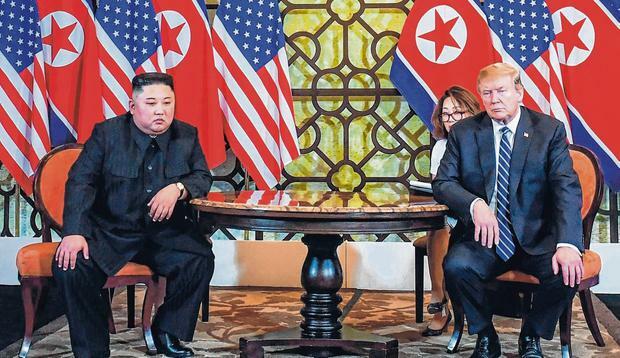 A second summit between US President Donald Trump and North Korea leader Kim Jong Un collapsed yesterday over sanctions, and the two sides gave conflicting accounts of exactly what happened, raising questions about the future of their denuclearisation talks. Mr Trump said two days of talks in the Vietnamese capital Hanoi had made good progress in building relations and on the main issue of denuclearisation, but it was important not to rush into a bad deal. He said he had walked away because of unacceptable North Korean demands. "It was all about the sanctions," Mr Trump told a news conference after the talks were cut short. "Basically, they wanted the sanctions lifted in their entirety, and we couldn't do that." However, North Korean Foreign Minister Ri Yong Ho told a news conference past midnight and hours after Mr Trump left Hanoi that North Korea had sought only a partial lifting of sanctions "related to people's livelihoods and unrelated to military sanctions". He said it had offered a realistic proposal involving the dismantling of all of its main nuclear site at Yongbyon, including plutonium and uranium facilities, by engineers from both countries. "This is the biggest denuclearisation step we can take based on the current level of trust between the two countries," Mr Ri said in a rare exchange between North Korean officials and reporters. "It's hard to say there will be something better than what we offered. We may not have such an opportunity again. We need such a first step on the road to complete denuclearisation. Our fundamental stance will never change and even if US seeks further talks, our position won't change," Mr Ri said. North Korean Vice Foreign Minister Choe Son Hui told the same briefing she had the impression that Mr Kim "might lose his willingness to pursue a deal" after the US side rejected a partial lifting of sanctions in return for destruction of Yongbyon, "something we had never offered before". White House spokeswoman Sarah Sanders, asked about North Korea's statements, said the president was aware of the comments and the White House had nothing to add to what Mr Trump said at the Hanoi news conference. Mr Trump spoke to the leaders of South Korea and Japan on his way back from Hanoi and told them that the United States would continue to work with them and talk to North Korea, Ms Sanders said. The United Nations and the United States ratcheted up sanctions on North Korea when the reclusive state conducted repeated nuclear and ballistic missile tests in 2017, cutting off its main sources of hard cash. Mr Trump and Mr Kim cut short their talks, skipping a planned working lunch at the French-colonial-era Metropole hotel after a morning of meetings. "Sometimes you have to walk, and this was just one of those times," Mr Trump said, adding "it was a friendly walk". At the same briefing, Mr Trump warned he could also walk away from a trade deal with China if it was not good enough, even as his economic advisers touted "fantastic" progress towards an agreement to end trade disputes. Failure to reach an agreement on North Korea marks a setback for Mr Trump, a self-styled dealmaker under pressure at home over his ties to Russia and testimony from Michael Cohen, his former personal lawyer who accused him of breaking the law while in office. The collapse of the talks raised questions about the Trump administration's preparations and about what some critics see as his cavalier style of personal diplomacy. Things had appeared more promising when the leaders met on Wednesday, predicting successful talks before a social dinner with top aides. The White House had been confident enough to schedule a "joint agreement signing ceremony" at the conclusion of talks. Like the lunch, the ceremony did not take the place. "No deal is a surprise, especially as they were both all smiley last evening," said Lim Soo-ho, senior research fellow at the Institute for National Security Strategy. "But no-deal today doesn't mean there won't be one in coming months. It means stakes were way too high for the two leaders to give another wishy-washy statement like they did in Singapore."